Bargaining with the administration over parking has come to an impasse, and we have now entered non-binding mediation (see the update here). The UMB administration has refused to budge on key aspects of their parking plan, which still includes plans to impose a $15 per day parking rate on our public commuter campus for on campus parking (West Garage, Lot D, Campus Centre garage), as well as the elimination of multi-use passes. We are at Impasse for Parking Bargaining! We need your input! NOTE: For current and previous bargaining updates see here. We hope you are having a great semester. Please join us on Wednesday to protest the high parking fees the university plans to impose. NOTE: The following letter was submitted to the FSU by the Graduate Employee Organization, who asked the FSU to send the letter to FSU members. 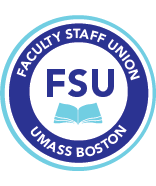 We have heard from sources throughout the university that there is some confusion regarding the new Graduate Assistant contract negotiated by the Graduate Employee Organization (GEO) and UMass Boston Admin. We hope to alleviate some of this confusion in this email.